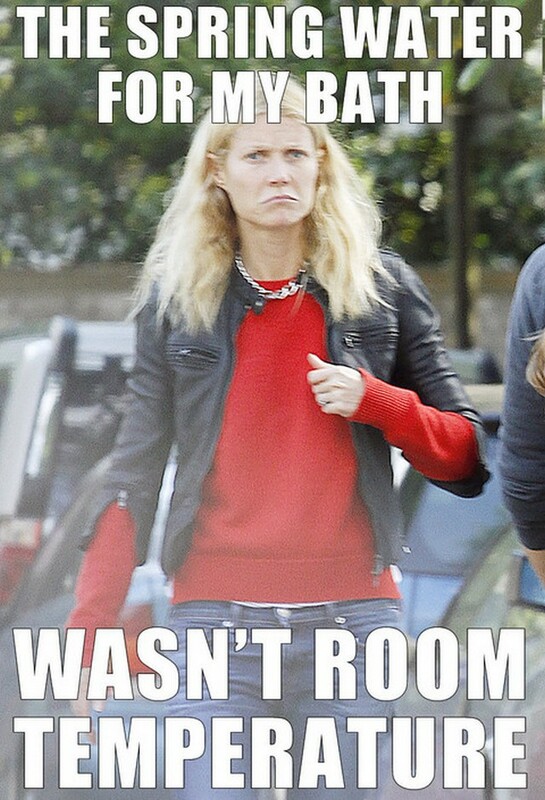 “I Am Who I Am” – Gwennie P.
Does anyone feel sorry for Gwyneth Paltrow? I heard she stuck her pedicured-Louboutin-size-9 in her mouth again. This time it was comparing being blasted on the internet much like a solider in war. Well. Sort of. Maybe. As a working momma, I got prickly with this comment. But I have preached not judging other mommas (or daddies) for their decisions – as long as their kids are safe and relatively happy. Gwennie has proven time and time again with her hilariously embaressing comments that she is out of touch with commoners, such as myself, but I can’t get mad at her for this. Sure, she has nannies. Sure, she only works long hours for short amounts of times. Sure, she probably has a chef and a maid and … whatever else I wish I had. But isn’t she away from her kids part of the day? Handing them over to someone to make sure they survive? She is putting the same amount of trust in that nanny that I put in our daycare provider. I still miss Mike daily and wonder if he misses me, if his needs are met too. Don’t all working mommas feel this way? Why does it matter if that momma is selling Avon, working part time at McDonalds, working high profile trials, finding a cure for cancer or starring in a summer blockbuster. I guess what I am saying is a momma is a momma no matter how you look at it. An ‘easy’ lifestyle is relative and the grass is always greener. But seriously, Gwen. Sweetie. Stop talking. You’ve been through a lot. Just hole up in your penthouse, take a nap and lay low. I’m sure your nanny has things under control.